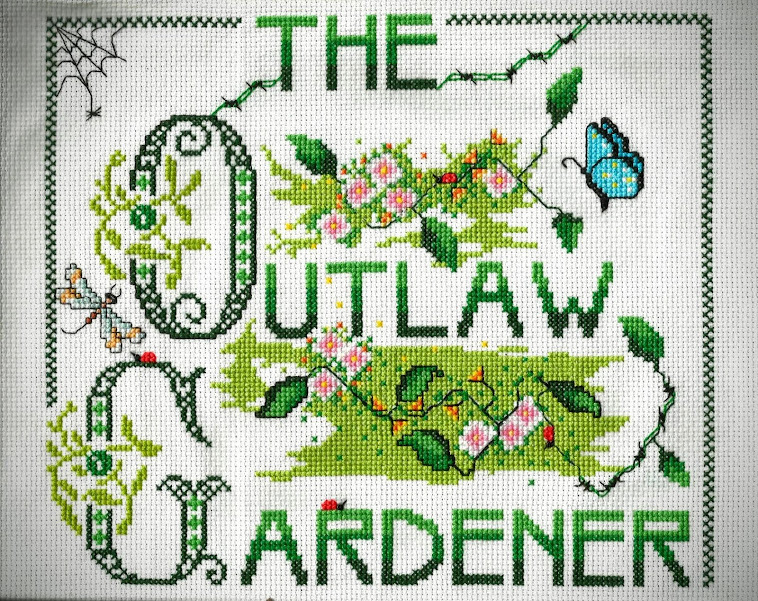 The Outlaw Gardener: A Gardener Gardens! It was a hot day in July and I'd just finished visiting some gardens up north. Having emptied my water bottle, I decided to stop by a Seven Eleven store on busy highway 99 to grab something to drink. On my way back to the plantmobile, a bit of color caught my eye behind the fenced store dumpsters. In this unlikely place, a gardener had worked a bit of magic. The juxtaposition of joyful cottage garden full of brilliant colors against the hot asphalt parking lot and chain link fence was thrilling. The words of Les Brake asked about his stunning zone 3 garden (he'd moved from much warmer Texas) echoed in my mind, "A gardener gardens." This is just what was visible from the parking lot of the store as I wasn't bold enough to go into the garden. I hope you're equally surprised by joy this weekend! What a pretty and colorful surprise hiding back there! 'A gardner gardens' - I love that! "A gardener gardens"... true words those. Ah, I am longing for the days of so much riotous color. Not looking forward to more heat. What a glorious display of colors! I confess I am a "flower-centrist" person and this cute garden is solid flowers, absolutely beautiful! These days we all need a little joy. Looking forward to a weekend of doing what gardeners do. I don't much love surprises, but when they look like this awesome and unexpected garden then, yep, I'll take it. May all surprises that come our way be ever so delightful. What a fun and colorful little spot! Really pretty. I would love to have a patch of my garden look this way right now. What a thrilling delight that was! What a lovely surprise. It is always fun to come upon a riot of color. A jubilant mix by a resourceful gardener! Joy created! Happy long weekend, Peter! What a discovery! What a joy! Creating beauty wherever it happens is a wonderful thing. WOW! Those unexpected gardens always lift my spirits. All those colorful flowers marring the bleak beauty of the asphalt and chain link. Some people are so uncouth. Thank you for this; it came just at the right time for me, when watering my potted garden seems like such a drug. I needed to be reminded of why I do it and this was perfect. And so pretty. i meant watering seems like such a drag! I love discovering inspired gardens in unlikely places! What an amazing garden, so much for location, location, location. I bet they barely notice the store when they're out there enjoying the color. What an unexpected pleasure. Good for you, following up on that fleeting glimpse to share it with us!